ICAD School of Learning, one of the leading training institutes of Central India for JEE, Medical and Foundation, is conducting the admission entrance test on April 7. Two-year JEE and Medical courses are designed for the students who have appeared for the 10th Board exam in March 2019 and Foundation JEE Programme for standard 7th examination appeared this year. 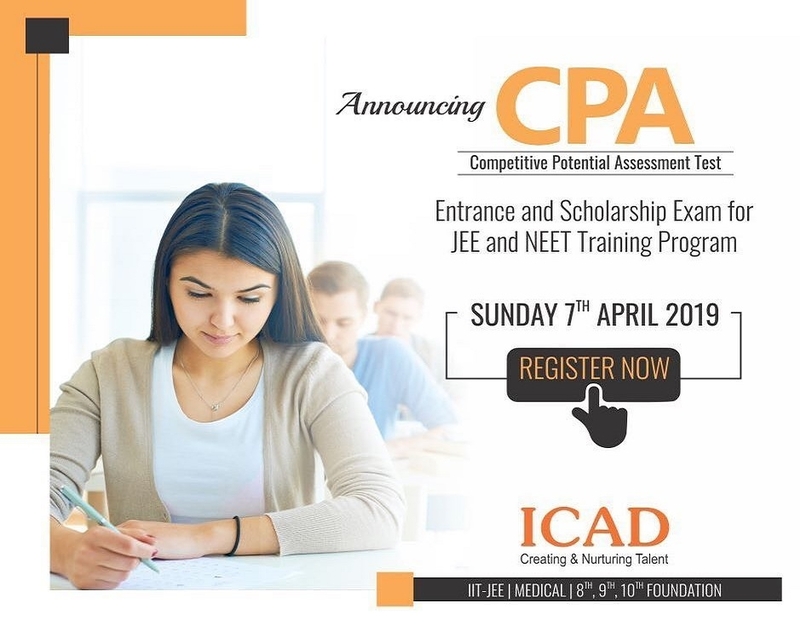 To get the benefits of the grueling result producing system of ICAD, interested and ambitious aspirants can register offline for CPA (Competitive Potential Assessment) Test till April 6 at ICAD training centers. ICAD also offers scholarship to the students who perform well in the CPA entrance test. For details visit ICAD located at 21, Tilak Nagar, opposite Basket Ball Ground, Tilak Nagar, (9823037090, 7887869157). East Nagpur students can visit ICAD EAST Nagpur Office on 2nd floor, 389, Hanuman Nagar Layout, near Pragati Bhawan, Krida Chowk (7757000299). In North, one may visit ICAD on 2nd floor Lotus Plaza, opposite, VCA, Civil Lines (7757039626, 7757039630).